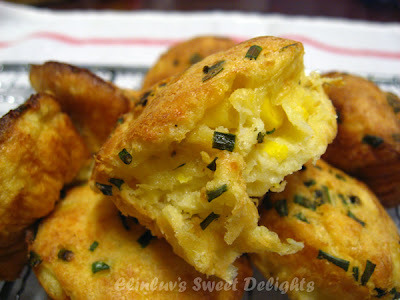 The original ingredients for this just corns kernels, chives, buttermilk, eggs, melted butter, black pepper, salt and sugar . 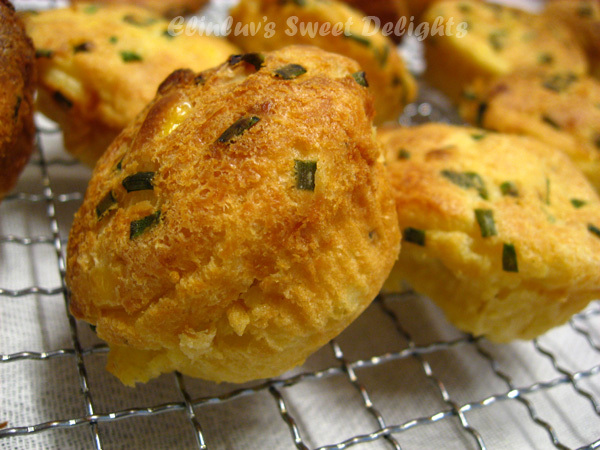 I added cheddar cheese for extra flavor and even though it did not popover, it gave me the texture I wanted. It is easy to whip up. I use my food proccessor and just give it a blitz for a few seconds and leave it to rest for 20 minutes before baking. Smitten Kitchen suggested that you can eat this popovers with a summery salad. For me, I served them for breakfast , as the popovers with the cheddar cheese is enough to be eaten alone with a hot cup of coffee :) This is healthy breakfast with just 1 tablespoon of melted butter in the recipe ! And my extra 1 tablespoon of cheddar cheese is for calcium for my old creaking bones LOL! making the slurp action all the time with long pinky tongue..
Place buttermilk and corn in a blender together and blend for just 3 seconds - you're looking to break up the corn a bit, not puree it. 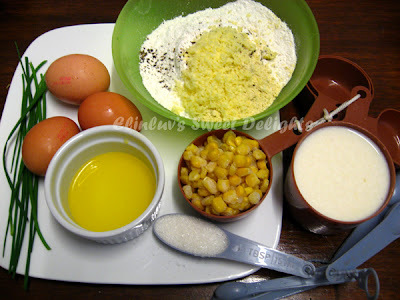 Add the eggs, one tablespoon of melted butter and blend for one second more. Add the flour, cornmeal, sugar, salt , cheese ( if using ) , a few grinds of black pepper and the chives and blend again until barely combined, some lumps are fine. Set the batter aside to rest while you preheat your oven to 375F or 190C , about 15 minutes. 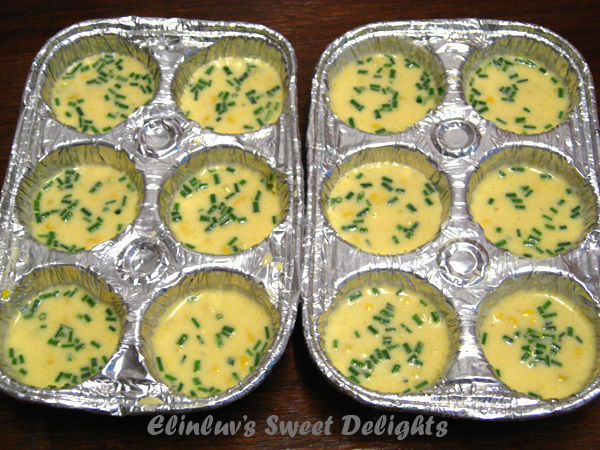 Brush your popover, muffin or ramekin cups with the remaining tablespoon of butter. Fill each cup slightly more than halfway with batter . 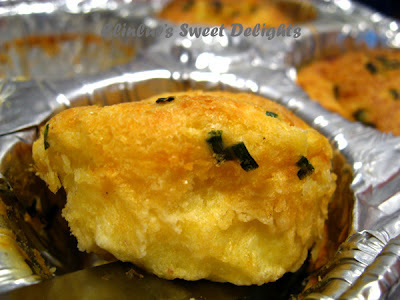 Bake popovers 30 to 35 minutes. 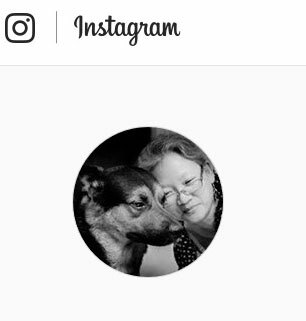 Try not to open the oven door ! Crack it just 1 inch to take a peak if absolutely necessary towards the end. Popovers are done when they are tall and bronzed. 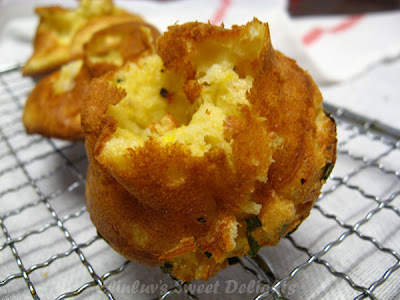 Flip popovers out onto cooling rack and let cool for a few minutes before tearing in. Even then, they will be filled with steam and very hot in the middle- be careful. Eat with a great big summery salad. 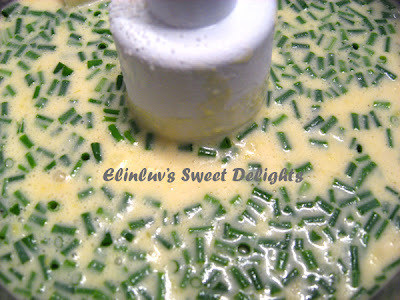 Eline can you tell me what is buttermilk? where can i get that? 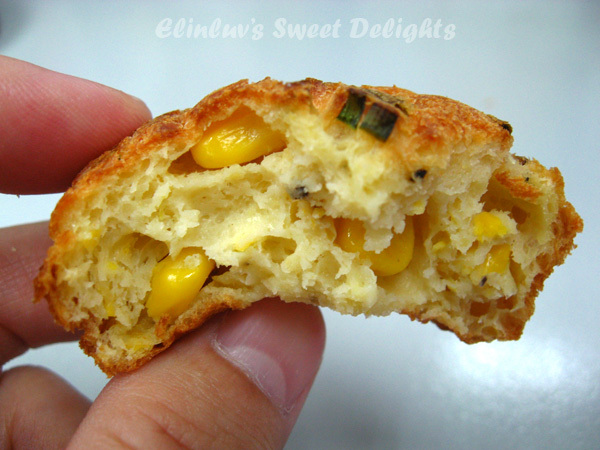 This muffin is nice with corn. 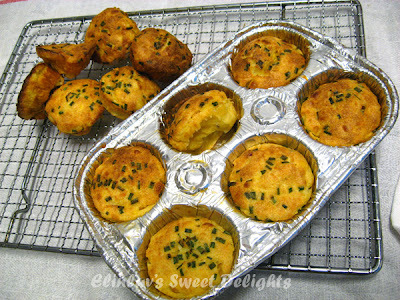 So is taste sweet or savoury..Looks good if I deep it with chilli sauce or satay gravy. アンゼエリン....Oopps I forgot to mention that SmittenKitchen has the recipe for making your own buttermilk. 1 cup of milk with 1 tablespoon of lemon juice or vinegar. Leave it to cuddles - 10 mins. Then you have your own homemade buttermilk. I could not get any from my place so I made my own...1 tablespoon of lemon juice to 1 cup of milk. Hmm, these look delicious, i like the golden look of thiese popovers. Oooh, so much flavor packed into a cute little snack. Wonderful!